Another bang for the buck! Nice and simple silk screen print on a blended cotton and polyester short sleeve shirt. These shirts have a heathered look and are soft to the touch. You can't go wrong with one of these! A bang for your buck! 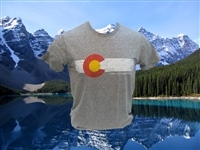 A unique Colorado "C" with mountains logo across the chest. Comes in heather royal blue or kelly green. 50% cotton, 50% polyster. This shirt is a great value at only $12.95. This shirt has a great hand in that it is very soft and feels great on. This shirt comes in the color Royal and Red and is sized small through XXL. The XXL cost $2 more. The shirt is 52% cotton and 48% Poly. This new arrival for the 2016/2017 ski season is a great shirt, especially for the price. This mountain print is a sharp, eye catching design printed on a blended 50/50 cotton poly Optima shirt that has a nice soft feel to it. New colors for the 2016/2017 ski season on this great shirt. 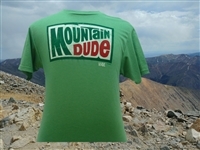 Priced to sell, this mountainous design is printed on a blended 50/50 cotton poly Optima shirt that has a very soft feel to it. This popular design shows mountains mirrored across the center of the pattern as if reflected in one of our pristine lakes with the slogan "Life is better in the mountains" and "you only live once" across the top. This great selling design is printed on a cotton poly blend which makes for a nice soft feel and a comfortable wear. New for the 2016-2017 ski season! This great design is priced to sell. This large mountain print has rays of sunshine coming off of it in a circular pattern. Printed on a soft 50/50 cotton poly blend. Also available in long sleeve here. "Not all who wander are lost" This great design is printed on a Gildan Ultra Cotton 50/50 cotton/poly blend for a softer feel. It features a large front print with nothing on the back. This cool design with a slightly retro look is printed on a Prairie Mountain 50/50 cotton/poly shirt that has a nice soft feel. A comfortable material to wear. This colorful print comes on your choice of 2 different materials. Both are Gildan Softstyle Ringspun shirts, but the red is a 90/10 cotton/poly blend while the royal is 35/65 cotton poly blend. This shirt shows a bear in the classic Air Jordan pose in a large print on the front. A new twist on classic logo. Dan's favorite! MAKE VAIL GREAT AGAIN! This amusing t-shirt is printed on a 100% cotton Gildand Ultra Cotton shirt. Large front print and blank on the back. A classic Colorado flag design in a slightly distressed design. Printed on a soft cotton/poly blend. What do you get when you cross a bear and a deer? A BEER, of course! 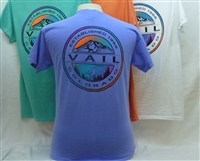 This 100% pre-shrunk cotton shirt comes with beer logo printon on the front and a small "Vail, Colorado" text across the back neckline. This colorful design is printed on a 100% cotton shirt which has been 'over-dyed" to give this shirt a unique color scheme. The dying process also pre-shrinks the shirt. There is a large print on the back and a smaller, but similar logo on the left chest. This popular short sleeve t-shirt has a full back print with a small left chest logo. It's printed on a 100% overdyed, preshrunk cotton shirt for a unique color scheme. Also available in long sleeve here. For the psychodelic you... This shirt is 100% cotton and only comes the way you see it. The color is charcoal and it has a left chest front print and full back print. How high are you? In this town, we're always high at 8,150 feet! This fun shirt is printed on a 100% cotton over-dyed shirt. Corey's favorite! A great way to remember your Back Bowl experience. Left chest and full back print. 100% garment dyed, preshrunk cotton. Also available as a long sleeve shirt here. Keep Calm You're Just High!! (8,150 feet) Screen printed on the front of a Gildan Heavy Cotton short sleeve shirt. Being 8,150 ft above sea level, you have to realize your body is being deprived of rich oxygen, so remember to just stay calm!! If you're over 21, then you know where this logo came from. Top of the print has the year Vail was established and the bottom reads "Born in the rocky mountains" underneath Vail in large letters. This is a 100% cotton shirt made by Coastal Classics and designed in California. It has a small front chest print and a large back print. Also available in long sleeve. A fun twist on a classic logo most of us have held in our hand at some point. This blended cotton/polyester t-shirt has a soft feel with a slightly distressed logo on it for a kind of retro look. If you're as competitive as us, you've had this conversation. An amusing shirt printed on a soft cotton/poly blended DuckCo shirt. This vibrant design shows the snowy Rocky Mountains with a skier at the bottom and the date that the town of Vail was established. This great logo is printed with a small left chest print matching the large back print on overdyed 100% cotton material. One of our best selling shirts. also available in long sleeve here. Bon appetit! 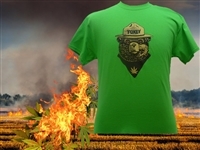 A Colorado original company, the Duck Company has been making custom shirts in Colorado since 1988. A great company that we love doing business with. This large front print is screened onto a 52/48 cotton/poly blend tee with a pleasantly soft feel.